The number of MLB players suspended Monday for alleged doping. One star was suspended last month for 65 games, Milwaukee Brewers outfielder and 2011 NL MVP Ryan Braun. The number of games A-Rod is suspended for through 2014 without pay, pending his appeal. That’s the number of games the 12 other players will each miss, also without pay. 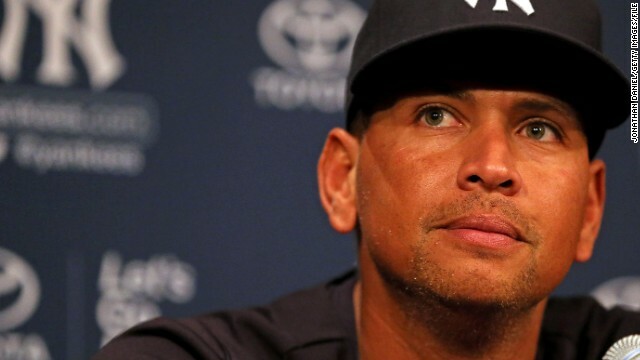 A-Rod is the one player – and only one - who is appealing his suspension. The number of home runs by A-Rod, the most of any active player. The number of All-Star games Rodriguez has played in during his 19-seasons in the major leagues. That’s how many Most Valuable Player Awards he’s received. The amount of his 10-year contract with the Yankees, signed in 2007, making him the highest-paid U.S. professional athlete ever. The amount of money he’s owed from the Yankees and is expected to be able to keep this year. How much money he could lose next year and into 2015 if the suspension takes effect. Major league baseball's highest paid player is fighting to stay in the game. Alex Rodriguez is the biggest name on a list of 13 players all facing major suspensions following an investigation into the use of performance-enhancing drugs. A-Rod is returning to the field tonight, as he appeals his 211 game suspension that could lead to him sitting out the 2014 season. The 12 other players all accepted their punishments of missing 50-games without pay. Anderson gets the latest from CNN's Jason Carroll and ESPN's T.J. Quinn. The suspension that could sideline Alex Rodriguez through the 2014 season is just the latest performance enhancing drug scandal scandal for Major League Baseball. The league has fought hard to keep banned substances out of the game. Anderson spoke with Kirk Radomski about why it is so difficult to do. Radomski started as a bat boy for the New York Mets. 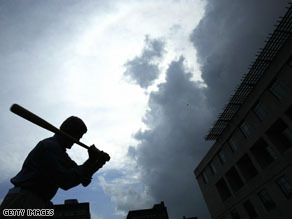 By the time the feds busted him in 2005, he estimates he was supplying 300 ballplayers with performance enhancing drugs. At least one fundraiser will take place today as the Washington Nationals kick off baseball season. When President Obama throws out the first pitch at the Washington Nationals' season opener on Monday, he will kick off not only a new baseball season but also a new round of fundraisers at Nationals Park. Though Obama won't be raising any cash himself on game day, his appearance will be the backdrop for at least one ballpark fundraiser Monday, the first of what Nationals President Stan Kasten hopes will be many political events held at the stadium this season. Since Nationals Park first opened in March 2008, Kasten has actively encouraged political operatives of all ideological stripes to hold their fundraisers and receptions at the ballpark, as opposed to more conventional venues such as restaurants or hotel ballrooms. Today, the President will throw out the ceremonial opening pitch at the Washington Nationals game. Learn more about past presidents taking part in this 100-year tradition. 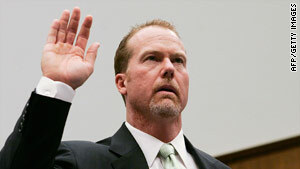 Former St. Louis Cardinal Mark McGwire appears at a House hearing on steroid use in March 2005. He called the widow of Roger Maris a few days ago, a surprisingly bold move that surely resulted in one of the most awkward phone conversations this side of Bobby Kennedy-George Wallace. Mark McGwire apparently felt it was the right thing to do. And, indeed, he was correct. Pat Maris deserved to hear the words "I juiced" straight from the artificially enhanced horse's mouth; deserved to know why she and her family had unwittingly served as his official cardboard props some 12 years ago; why her late husband's single-season home run mark (arguably the most hallowed standard in all of American sports) had been tattered by a man boasting all the integrity of a Times Square pickpocket. Think back, if you will, to September 8, 1998, when McGwire hit his record-breaking 62nd homer of the season at Busch Stadium, then immediately walked toward the stands to embrace the Maris children. Later, with tears streaming down his cheeks, McGwire told the media how, earlier that day, he had held the bat Roger Maris used when he set the old mark. "I touched it with my heart," he said. "When I did that, I knew tonight was going to be the night. I can say my bat will lie next to his, and I'm damn proud of it." Mark McGwire deserves a ban from baseball more than any sympathy. It is sad to hear his quavery confession of a career filled with steroids, his sorrow over the pain it caused his family and fans, his revelation of a life of lies that burned inside him like a hidden disease and consumed the game he loved. But for those of us who also love baseball, the damage he did was too deep and his further threat to the integrity of the game is too great to justify his return. McGwire's entire playing career is indelibly stained and his judgment is not to be trusted. What else are we to make of a man who cheated and didn't come clean for 20 years? Can he be trusted to coach other players who may be using steroids? Is he fit for any job that is also a test of character and personal standards? Baseball should bar him from coaching and never again allow his name on a Hall of Fame ballot. St. Louis manager Tony La Russa, McGwire's longtime apologist, is leading the charge to rehabilitate him in his new role as the Cardinals' batting coach, saying Monday's admission and expression of regret is worthy of respect. The Little League World Series is over and one thing, if you watched, you saw more than a dozen times a game: a Little League pitcher baffling a hitter with a curve ball, with no idea the damage he could be doing to his arm and his baseball future. For the past several seasons, sports medicine researchers at Georgia Tech University in Atlanta have tracked every single pitch of the televised Little League World Series (LLWS) games. 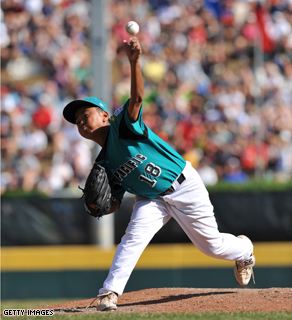 They found that the use of the curve ball goes up every year, and so do the number of youth pitcher arm injuries. A few years ago, I attended a coach’s clinic put on by Georgia Tech and the Atlanta Braves. The Braves’ team doctor was there, as well as the best known arm surgeon to athletes – Dr. James Andrews – from Birmingham, Alabama. The evidence they laid out was clear: more curve balls were thrown every year, year by year, in the LLWS. And the number of arm surgeries needed for youth pitchers went up along with that (although no one has tracked how specific LLWS pitchers fared after their Little League pitching days). In a recent New York Times Magazine story, Dr. Andrews described an "epidemic" of arm and shoulder injuries to young ballplayers. Andrews says in 2001 and 2002 he performed a total of just 13 shoulder operations on teenagers. Between 2003 and 2008, he did 241. 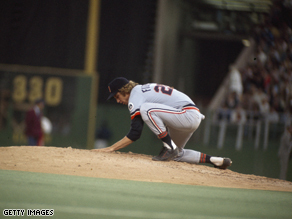 Mark 'The Bird' Fidrych #20 of the Detroit Tigers prepares to pitch to the Minnesota Twins during a regular season game on June 20, 1976 in Minneapolis, Minnesota. There was another time in Detroit history when a bailout was needed. In the mid-1970s, the Big 3 American automakers were humming along in a heyday never to be seen by them again, but the Motor City’s baseball team was old and stinky. In 1975, they were the worst team in baseball, with 102 losses and a roster filled with many players well past their prime. But along came Mark Fidrych, a 21-year-old goofball lanky kid with a heavy Massachusetts accent, who won over a city in just a few months. And uncommon back then, the athlete morphed into a celebrity, for one brief, albeit magical season. It was nearly impossible to turn away from today’s hearing on Capitol Hill and the “he said/he said” between star pitcher Roger Clemens and his former trainer, Brian McNamee. Clearly someone is lying… but that’s not the biggest question here. For many Americans, who’s telling the truth comes in a distant second to why Congress is spending so much time worrying about alleged steroid use in professional sports. So why is Congress so concerned with steroids? And what do they say to those questioning whether this is the best way to spend their time in Washington? I’ll have those answers for you tonight. Program note: Erica joins 360° from New York tonight – her new home at CNN. We are all very excited!